The wiring of the robot and providing power to the Servos is the most crucial part of the build. Whilst the voltage provided isn’t enough to seriously injure students it can certainly provide a nasty shock and possibly fire. 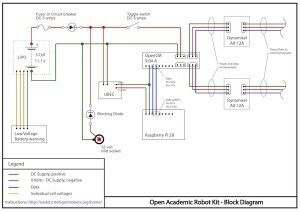 We have provided a wiring diagram which will assist you in creating a safe wiring harness for the robot. Ensure that there are no dry solders and you use heat shrink and electrical tape to cover any exposed connection. You can download the PDF version of the OAR Kit Block Diagram. The recommended mobile power source is an 11 Volt Lithium Polymer (LiPo) battery. Do not charge or use batteries if the battery …. 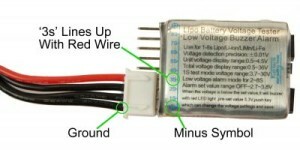 LiPo Batteries are comprised of 3.7v cells i.e. a 11.1v battery has three, 3.7v cells. The balance connector gives you individual access to each of these cells. This will allow you to individually monitor and charge cells. This is called ‘balanced charging’ and will increase the lifespan of your battery. We recommend that you use a LiPo with a Battery Voltage Tester/Monitor. This device is capable of monitoring each cell in your battery and sounding an alarm when the battery gets too low. This is essential for the care of your battery – if you let your battery fall low in voltage, the battery will become permanently damaged and unusable. For more information regarding caring, storing and charging your LiPo battery we recommend visiting the Trossen Robotics website. 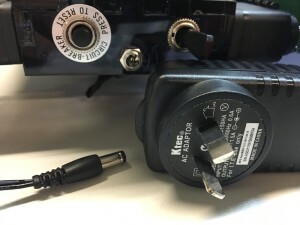 Your robot can also be fitted with a DC Barrel connection which will allow you to run the robot off mains power whilst testing or programming. This is a recommended feature as it will also allow you to use the robot while batteries are charging or if students forget to charge the battery.